Sunday saw a last glimpse of summer, the sun was warm enough for a foray into the garden to dig the last of the potatoes and pick the last few baby courgettes. I cleared the spent runner bean plants, the now defunct courgette plants and put them into the compost bin to rot down over winter ready to enrich the raised beds ready for the spring sowing. 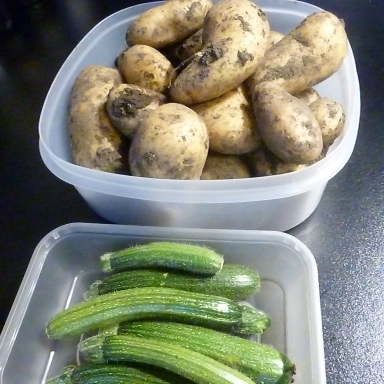 So what to do with these few courgettes, some of the potatoes and the rather sad contents of my fridge. As I simply haven't had the time to shop this week we'll make do with what we have to hand, a good chance to offer a little inpiration then. OK so I have this array on my worktop but what to do with it? After a brief deliberation I scraped the potatoes, cut them into large chunks and boiled until soft but not soggy. I chopped the onion and finely sliced the carrots and gently fried these off in the olive oil. I chopped the green tomatoes and added these to the pan, stirring until everything started to amalgamate. T hen I added the mince and the drained chick peas plus 1/2 the stock cube dissolved in a little hot water (the other 1/2 can be used again).Simmer gently until the carrots are cooked through, Quorn mince takes no time at all to cook so don't overdo the simmering. Chop the herbs and add to the pan. 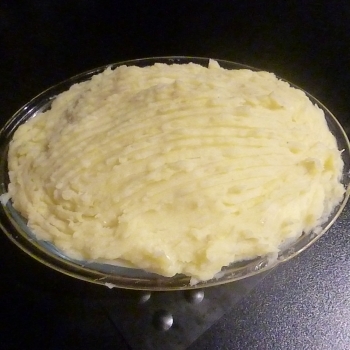 While that's cooking drain the potatoes and mash with butter or a little olive oil (use a little milk or mil k alternative if you'd rather not use butter). 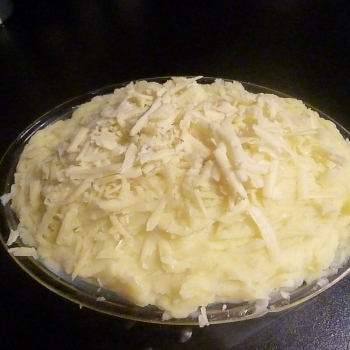 Mix in 1/2 the grated cheese and mash until smooth. Set aside and turn on the oven or the grill. Taste the mince mixture, does it need seasoning? 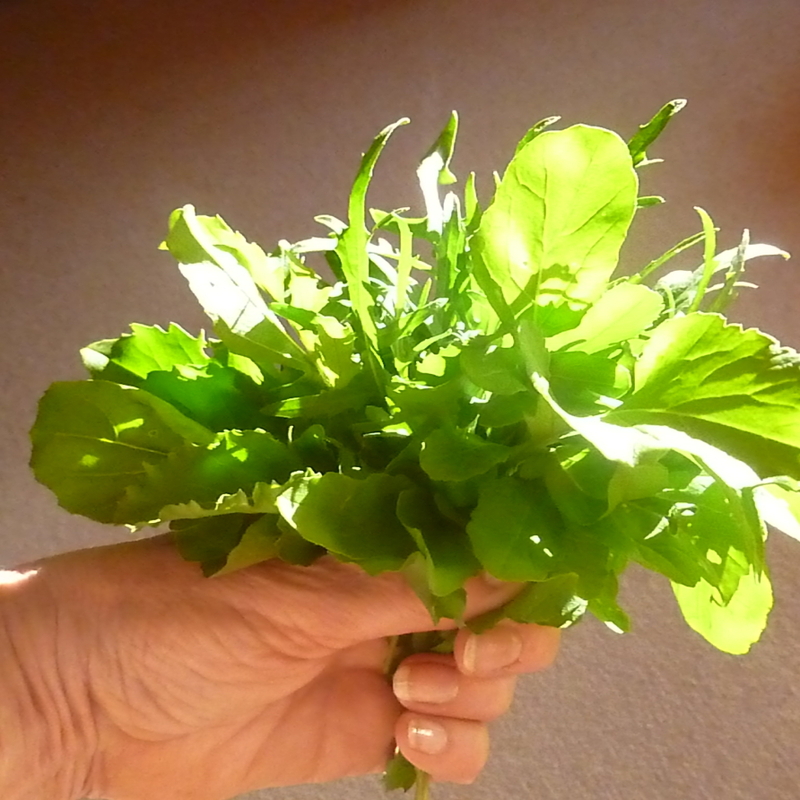 At this point stir in the chopped rocket and let it wilt down for a minute or so and taste again. Does it need something else? I decided to thicken with tomato puree...but realised I'd run out so used tomato ketchup instead, just a little to thicken and to add a little depth of flavour. I also stirred in a 1/2 a teaspoon of yeast extract for umami, it's subtle but if you hate it leave it out. A twist of pepper and a pinch of salt if needed and the mix is done. 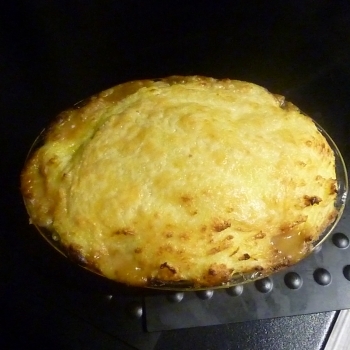 Put the mixture int o an ovenproof dish and carefully spoon the cheesy potato over the top. Spread it with a fork to cover evenly. Sprinkle on some more grated cheese and cook in the oven or brown under the grill. 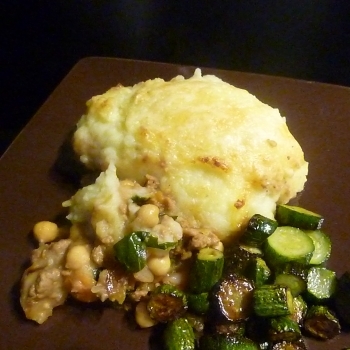 I served this alternative to a cottage pie with sautéed baby courgettes but any green vegetable is a good addition. Voila, less than 30 minutes from idea to plate. This is definitely a comfort food dish but you could make individual ones in small dishes as part of a smarter meal. The combinations are endless, use your imagination. Happy cooking.